← Let’s walk away and play a different game. Here is an update on what I’ve been thinking and doing since my return from Asia two months ago. I know this is a busy time of year for everyone, so I’ll keep it brief. The 2011 International Conference on Sustainability, Transition & Culture Change: Vision, Action, Leadership that was held in Michigan in November was very productive and enjoyable. Amongst the participants with whom I had opportunity to interact were Australian economist Steve Keen, author of Debunking Economics, Nicole Foss of Automatic Earth, and Albert Bates of the Eco-village Training Center and The Farm in Tennessee. I was also inspired to hear the stories of a number of land-based participants from Michigan and the Midwest who have taken significant steps to prepare for the transformation and are well positioned to thrive throughout the chrysalis stage of the ongoing societal metamorphosis. I gave a somewhat abbreviated version of my slide presentation on The Emerging Butterfly Society. This was recorded, along with the rest of the conference proceedings, and can be accessed at http://www.livestream.com/localfuture/video?clipId=pla_ade24121-d46d-4448-863c-babe129a604f . Be sure to also watch Albert Bates’ amazing story about the history of The Farm. It’s a remarkable tale of what a small group of people can achieve to help others when they have love in their hearts and shared objectives. I was also invited, by one of my colleagues who lives in the area, to be interviewed for a cable TV series that he produces (Investigating Community Resilience), for a program called Outside In. On the day following the conference we met at Up North studio in Traverse City, Michigan to record two half-hour segments that were to be broadcast via cable during the following weeks. These are now available on the program website. 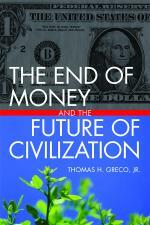 The first segment can be downloaded at http://ir.nrec.org/content/author-tom-greco-talk-about-history-money-and-debt, and the second at http://ir.nrec.org/content/more-tom-greco. I think these went particularly well because the interviewer, Dave Barrons, is an TV personality with many years of experience who has a strong interest in the topics of my books and was well prepared with some excellent questions. Please watch these and pass the word along to your networks. The next in this series of Local Future conferences is being planned for the end of May 2012. Since next year’s BALLE conference will be held in Grand Rapids from May 15 to 18, it seems advantageous to hold it in the same city immediately following. Watch the LF website for details. As I wrote more than three years ago in The End of Money, “the growth god is dead.” We must face the fact that the limits to physical growth have been reached. This does not necessarily mean a decline in living standards or a global war for control of resources. There is plenty enough to provide a dignified life for everyone on the planet and even two or three billion more. We have been tremendously successful in developing “labor saving” machinery and technologies that can make us more healthier and more comfortable. The problem is that those benefits have not been equitably distributed and the whole range of incentives that are built into the industrial society promotes waste and conflict. We can all live much better while consuming less stuff, but to achieve that we’ll need to reinvent money, banking and finance. Accelerating debt growth cannot continue much longer. One way or another, much of the existing debt will need to be written off in the coming years. Will it be done deliberately, fairly, and systematically, or in a chaotic collapse of the global financial system? If you want to understand what is happening on the global financial front, please watch this dialog between Chris Martenson and James Turk as they talk about Europe and the global economy: http://www.youtube.com/watch?feature=player_embedded&v=BsMj59hyJOQ. Chris Martenson (The Crash Course). Over the past several weeks, I’ve posted a number of comments and links to materials about the Occupy movement. The most recent of these highlights a panel session that was held on November 10th at the New School in New York City. The panel was titled, Occupy Everywhere: On the New Politics and Possibilities of the Movement Against Corporate Power. It featured Oscar-winning filmmaker and author Michael Moore; Naomi Klein, best-selling author of the Shock Doctrine: The Rise of Disaster Capitalism; Rinku Sen of the Applied Research Center and publisher of ColorLines; Occupy Wall Street organizer Patrick Bruner; and journalist William Greider, author of Come Home America, Who Will Tell the People?, and, Secrets of the Temple (about the Federal Reserve). The panelists provided some interesting perspectives on the movement. You can find the video and a transcript of the proceedings at the Democracy Now! website. Yes! Magazine, in conjunction with Berrett-Koehler Publishers, has just come out with an excellent booklet, This Changes Everything, which both describes and gives some direction to the Occupy movement. It features brief statements by more than a dozen leading voices, including David Korten, Naomi Klein, and Ralph Nader. You can get a copy from Yes! Magazine. I recently read the book, Killing Pablo, a story written by Mark Bowden (Black Hawk Down). I didn’t seek it out, it just appeared, so I grabbed it. It’s all about money, drugs, power, violence, and corruption, specifically related to the Columbian drug cartels and Pablo Escobar. It is an astounding example of the breakdown of law and order and the corrupting power of extreme wealth, particularly when in the hands of ruthless sociopaths. That is not to say that Escobar was the only one using the tactics of violence and terror. In the end, it seems it was the use of those same tactics by paramilitary groups with shadowy connections to both the Columbian and U.S. governments that brought Escobar down. This is a chilling story of what can happen when terror, intimidation, and assassinations become a way of political life. The cartels and power brokers had (have?) a way of posing a choice to the government and military officials they sought to corrupt—plato o plomo, (silver or lead)? That was no idle threat. The cartel(s) had (have?) the wherewithal to carry it out. No one was safe in Columbia during that time. They could protect neither themselves nor their families. Police, soldiers, politicians, legislators, and judges were assassinated by the thousands, their family members kidnapped and often murdered, and innocent civilians killed in frequent bombings. This is a book that will cure you of any residual naiveté you may have regarding money, power, and politics. 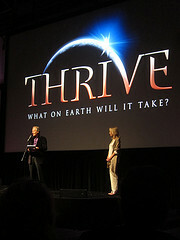 I recently viewed the movie THRIVE: What on Earth Will it Take?, and attended a discussion group about it in Berkeley. The movie, a documentary produced by Foster Gamble, addresses the same basic questions that set me on my current path many years ago, namely, why is there so much suffering and deprivation amidst great opulence, and why is the earth being continually despoiled with no end in sight? What will it take to enable everyone on the planet to live a dignified life and realize their full potential? While some may not relate well to the first part of the movie that considers free energy and UFOs, the movie is well worth viewing for its description of the domineering mindset and elite control that characterize our present reality, and for its inspirational vision of what our future could be. THRIVE groups are springing up in many places as people seek to understand the dimensions of our situation, and to help one another decide on appropriate actions. May the true meaning of Christmas fill your heart with happiness all year! Whatever your religious background might be, I invite you to contemplate these questions, What is the true meaning of Christmas? What is it that all religions are supposed to provide? How can we make religion a force that brings us all together instead of one that separates us? Peace on Earth and Good Will Toward All! This entry was posted in Emerging paradigm, My activities, The Political Money System and tagged Local Future, The Occupy movement, THRIVE. Bookmark the permalink. I’ve been studying the religion concept for many years now. From the christian perspective I have challenged christian assumptions at their core, and using the Bible as the basis for doing so. Ultimately, christianity will de-volve from the mass media, mass produced evangelism that the Hearst newspaper syndicate began to “puff” Billy graham, to model after the interactive discussion process in which people get directly involved in community actions minus doctrinal disputes. What is required in that area, is a complete re-examination of ideologies and doctrines, with new emphasis on the power of choice, knowledge emerging from the study of Artificial Intelligence.